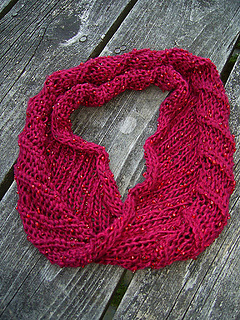 Pattern available for purchase, or free from Baadeck Yarns with purchase of required yarn. 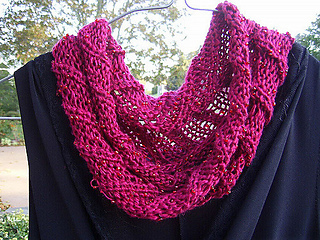 Uses Moebius cast-on, found in either of Cat Bordhi’s Magical Knitting Treasuries. Sometimes a yarn is so extraordinary, a single skein is all it takes to make that special piece for your dramatic entrance. Beaded silk definitely fits the bill. 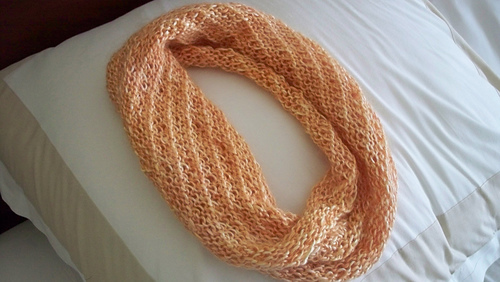 For this easy yet effective cowl, you’ll work a Moebius cast on and begin a 6-stitch repeat over a round that is one stitch short of a multiple of 6. This means your pattern will wander left, without even having to keep track of your beginning of round!